Looks like someone at Hindustan Times jumped the gun. 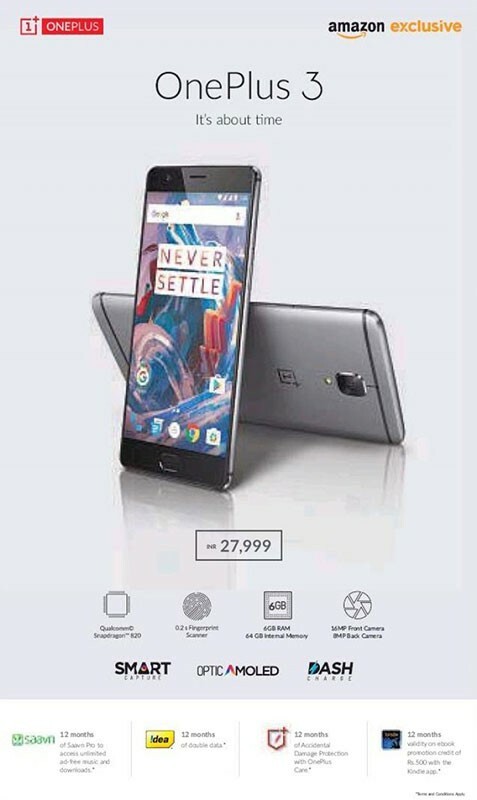 The major Indian daily newspaper published an ad for the upcoming OnePlus 3 one whole day before the phone got officially announced. The ad doesn't leave much to the imagination. It shows the phone with some basic specifications below, such as the Qualcomm Snapdragon 820, fingerprint sensor (which apparently unlocks in 0.2 seconds), 6GB RAM with 64GB storage, 8 megapixel rear camera and 16 megapixel front camera (yes, you read that right). The phone also has something called Smart Capture, Optic AMOLED display, and DASH Charge. The phone is priced at INR 27,999, which is about $416, and will be available exclusively through Amazon. Hopefully, this is the price of the exact specifications mentioned above, and not of the base model (assuming there are multiple models being launched in India). OnePlus also has some offers to get the most out of your money, with a 12 month subscription to Saavn (a music streaming service), 12 months of double data for Idea subscribers, 12 months of accidental damage with OnePlus Care, and INR 500 credit for purchasing Kindle ebooks with a 12 months validity. The phone will be officially announced in a few hours from now. I'm curious about the camera, is it front 16MP or rear 16MP? Which article is true?